The coordinates of the camel trail remains we had found plotted perfectly on the trail visible on the Landsat image. And no wonder that we didn’t find anything close to our find location. Although the trail cut the meteorite’s position only seventy meters away, just there was a wide depression filled with a blanket of holocene deposits that covered any remains of the trail. It had been right there where we were looking for it, only under half a foot of sand deposits. Unfortunately the Landsat images gave no hint to the beginning or end of the trail. Although visible for a distance of 20 miles at its endpoints the trail faded out on younger surfaces. It remains to be seen if the study of other sources can provide further insight on the contemporary caravan trade routes in the questioned area. After we had wrapped in and secured the Alamat rock in the back of the car we replaced the landmark by a tin sheet we dug in at the spot of the find. We found one more chondrite that afternoon, a quite attractive specimen of about 600 g, but since the find of “El Alamat”, as we had dubbed the mother of all space rocks, everything stood in its shadow. The awareness that the desert had granted us an exceptional moment lasted for the rest of the day and the weeks to come. I felt as if a veil had been lifted for us and we had been allowed to catch a glimpse of the wonders the desert still holds. 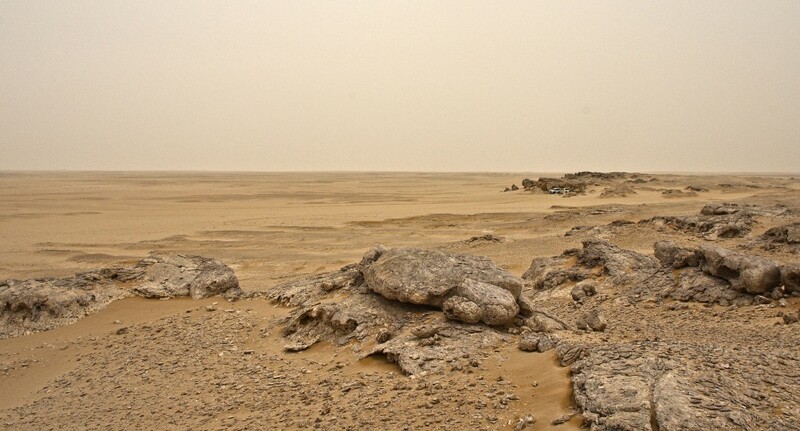 Once there was a time when the vast empty nothingness of the African and Arabian deserts was as unapproachable for foreigners as a distant planet. Only those dwelling at its fringes dared to advance into its inner heart, often putting their lives at stake. Still up to the twenties of the previous century only three out of ten Europeans starting out for the inner Sahara desert returned, often with the loss of the complete expedition and on the brink of insanity. Those times have changed. 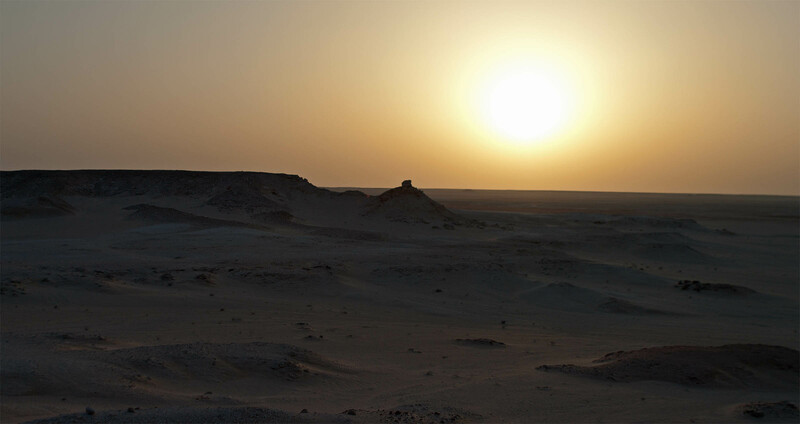 Today most of the African and Arabian deserts are planted with oil rigs, radio masts and airstrips, cut by a plethora of civil and military infrastructure, crossed by tire tracks without number and there is hardly a corner where not at least a sandblasted can or bottle tells about human presence in the not so distant past. To the modern day traveller it must appear, as if man has finally achieved a firm grip on the indomitable zones. But the appearances are deceptive. While new installations are constantly being built, many of the present structures are already decaying and in the majority of cases they are only of temporary nature or for the purpose of mere transit. Desert projects have sparse life spans. Few of them, like the Great Man Made River Project in Libya or the Saudi Arabian agriculture initiative for example, share a long term perspective. Human presence appeared to always have been brief in the continental Ergs and Hammadas of the tropic deserts. As time goes by the ever shapeshifting surfaces erase the most obvious traces of man. But not only the traces of man. The abrasive and eroding nature of the desert leaves only a short time frame for a find like ours. In geological terms the time span a meteorite outlasts the effects of surface weathering, even in the hyper arid deserts, is desperately brief. Only the sheer abundance of fall events accumulating over the millennia allows us to find any largely intact specimens at all. 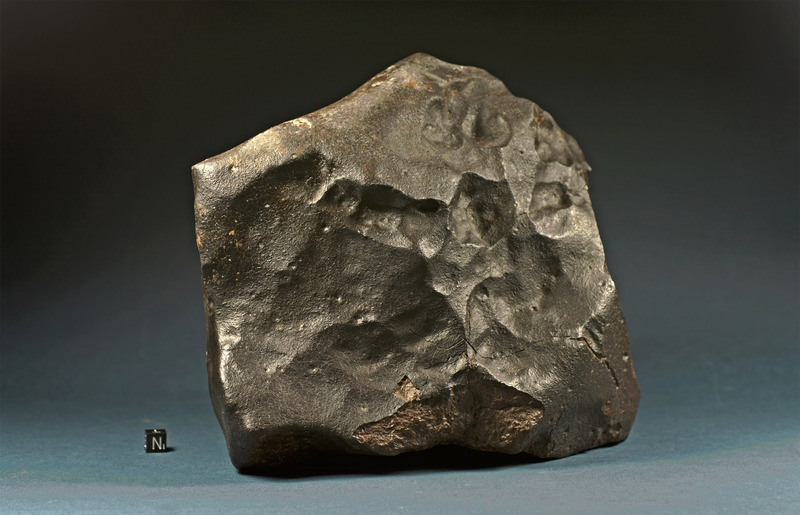 Stone meteorites exceeding 10 kg in weight are rarely found, those approaching 20 kg are exceedingly scarce. There may be less emerging from the hot deserts per year than you can count on the fingers of one hand. A find like ours, with its surface features preserved and still in one piece is all the more remarkable. It gives us a slight idea on the proportions within the vast clouds of cosmic debris, remains of catastrophic asteroidal collisions, which from time happen to cross the path of our stone pelted planet.